unexpectedly fired, failed or dropped out of school or college). sion in DBTF describes the level of severity and chronicity. sode trauma (type I) (e.g., car accident) and complex traumas. health utility in mapping symptom or syndrome profiles. trauma profiles, for example, in refugees and torture survivors. type IV or cumulative trauma. not related to the car accident”. 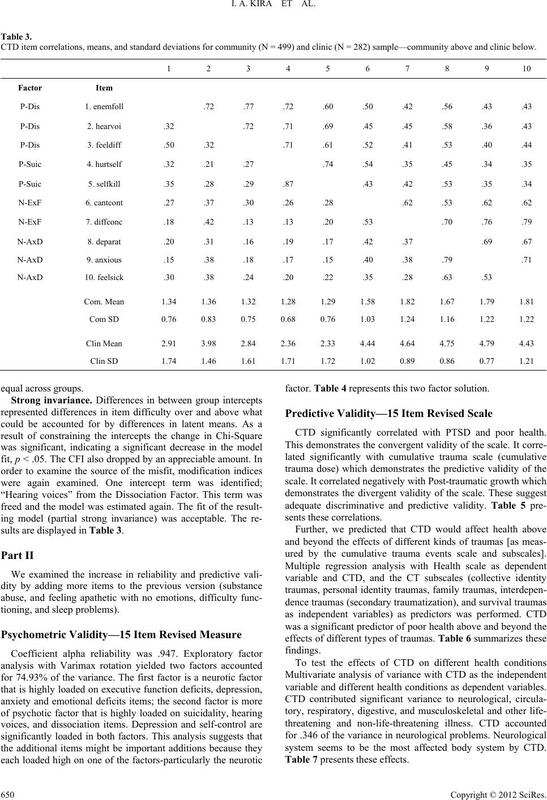 concept of cumulative trauma and CTD. 1995, Wenzel, Sibitz, Kieffer, & Strobl, 1999). paired emotional processing (e.g., Rachman, 1980; Fao, 1996). other symptoms of impaired mood. attitude towar d c h il d r e n, women or family. Farrag, 2009) Substance abuse can be attempts to self-medicate. larly important for screening in general practice. different cultures and populations (e.g., Scazufca et al., 2009). depression, anxiety, fatigue, or somatic complaints in CMD. Chelminski, Dalrymple, & Galione, 2012). sent in multiply traumatized populations. by other different studies on different populations and cultures. on a community sample of Iraqi refugees in Michigan USA. respondents (30/215) reported that they were jailed and tortured. adding new five items to have a 16 items scale (see Appendix). Present, (4) Very Much Present. not was also collected from the clinical files. 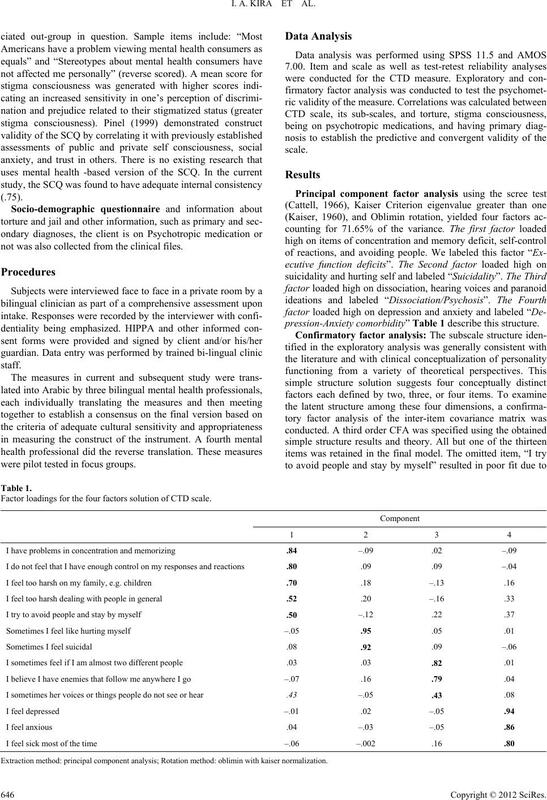 pression-Anxiety comorbidity” Table 1 describe this structure. Factor loadings for the four factors solution of CTD scale. Extraction method: principal component analysis; Rotation method: oblimin with kaiser normalization. significant (p < .05) and all, but one, were greater than .6.
consistency of the entire set of items was satisfactory, alpha .85.
a 6-week inter-test interval. The test-retest correlation was .78.
psychotropic medications (R = .28**) and with torture (.16*). four sub-scales and these variables. 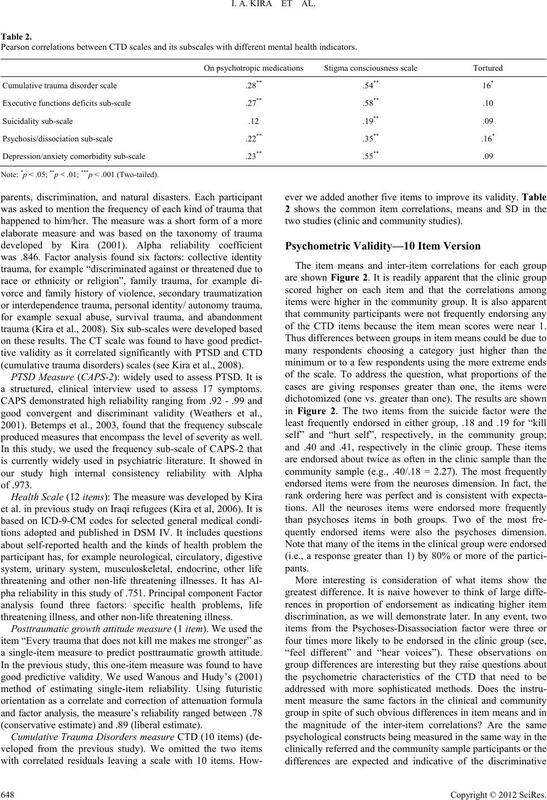 scale) would predict CTD, PTSD and physical health. tion provided by the estimation study. $30,000 and $35,000; and 6.8% made over $35,000. 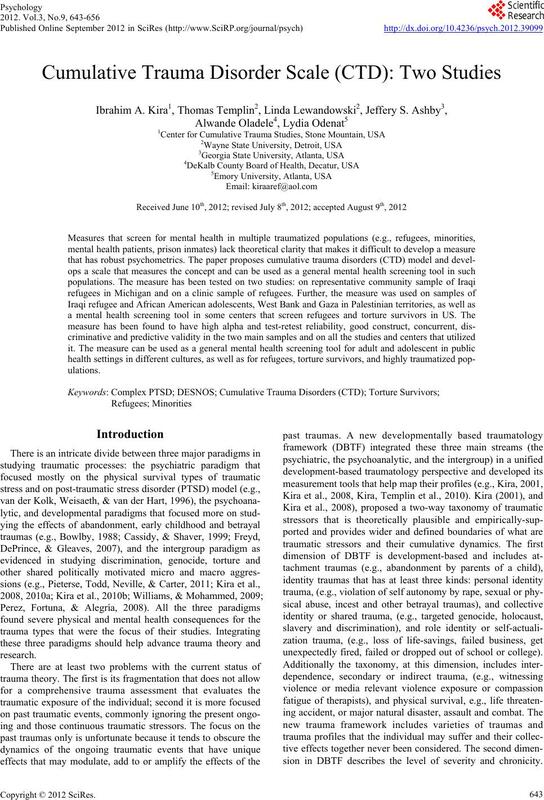 Pearson correlations between CTD scales and its subscales with different mental health indicators. Note: *p < .05; **p < .01; ***p < .001 (Two-tailed). (cumulative trauma disorders) scales (see Kira et al., 2008). a structured, clinical interview used to assess 17 symptoms. produced measures that encompass the level of severity as well. threatening illness, and other non-life threatening illness. a single-item measure to predict posttraumatic growth attitude. (conservative estimate) and .89 (liberal estimate). two studies (clinic and community studies). of the CTD items because the item mean scores were near 1.
quently endorsed items were also the psychoses dimension. option higher than one. All differences were significant (p < .01). RMSEA = .07]. These additions made theoretical sense as well. this is a two-factor solution. but undifferentiated in the community sample. it was .67. No other loading coefficients were this discrepant. groups this item should be weighted differently for each group. (Byrne, Shavelson, & Muthén, 1989). 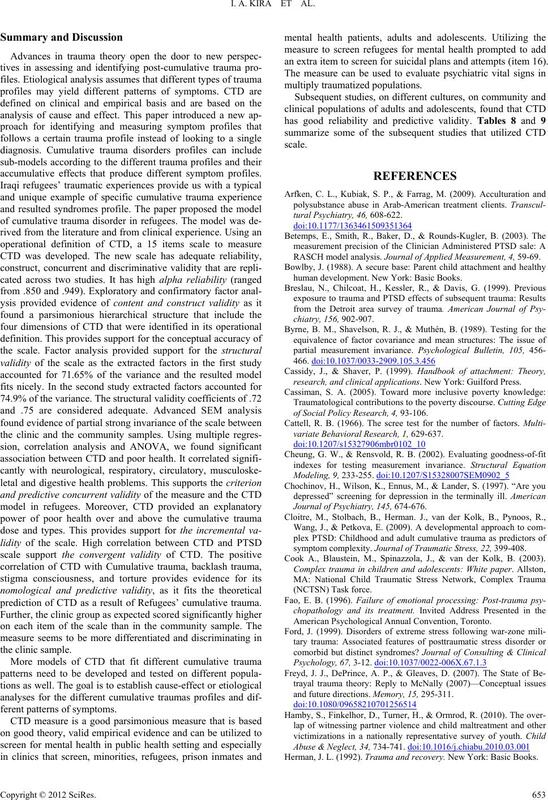 CTD item correlations, means, and standard deviations for community (N = 499) and clinic (N = 282) sample—community above and clinic below. sults are displayed in Table 3.
factor. Table 4 represents this two factor solution. 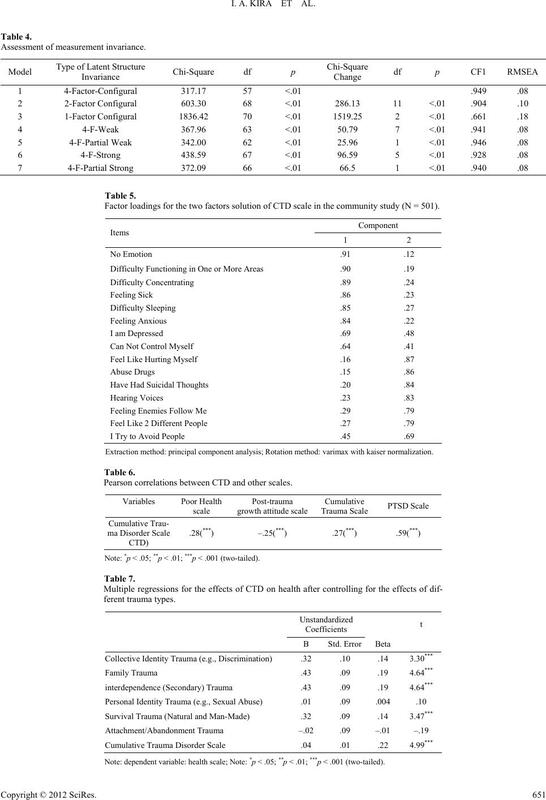 CTD significantly correlated with PTSD and poor health. ured by the cumulative trauma events scale and subscales]. variable and different health conditions as dependent variables. system seems to be the most affected body system by CTD. Table 7 presents these effects. 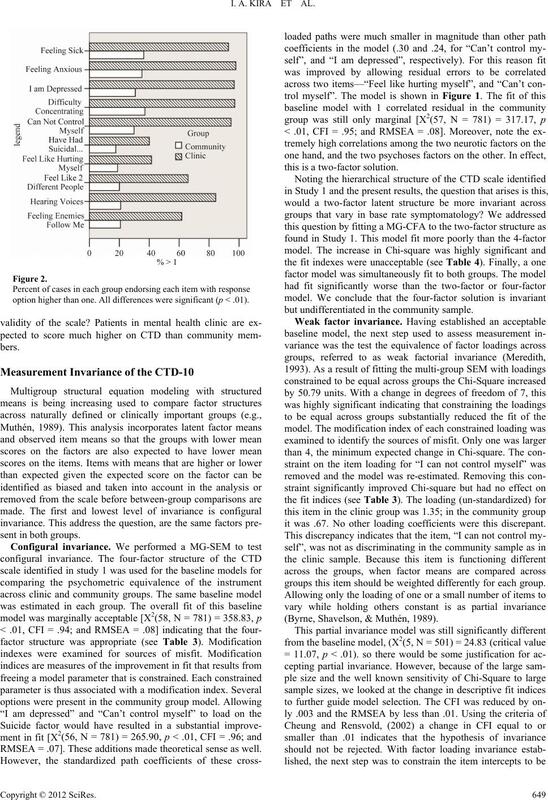 Factor loadings for the two factors solution of CTD scale in the community study (N = 501). Extraction method: principal component analysis; Rotation method: varimax with kaiser normalization. Pearson correlations between CTD and other scales. Note: dependent variable: health scale; Note: *p < .05; **p < .01; ***p < .001 (two-tailed). 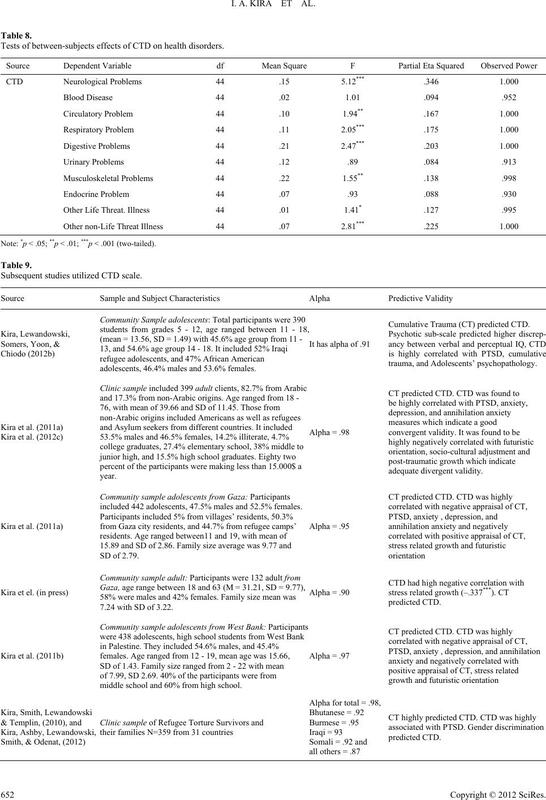 Tests of between-subjects effects of CTD on health disorders. Subsequent studies utilized CTD scale. adolescents, 46.4% males and 53.6% females. Cumulative Trauma (CT) predicted CTD. included 442 adolescents, 47.5% males and 52.5% females. 7.24 with SD of 3.22.
middle school and 60% from high school. accumulative effects that produce different symptom profiles. prediction of CTD as a result of Refugees’ cumulative trauma. an extra item to screen for suicidal plans and attempts (item 16). RASCH model analysis. Journal of Applied Measurement, 4, 59-69.
human development. New York: Basic Books. of Social Policy Research, 4 , 93-106.
variate Behavioral Research, 1, 629-637. 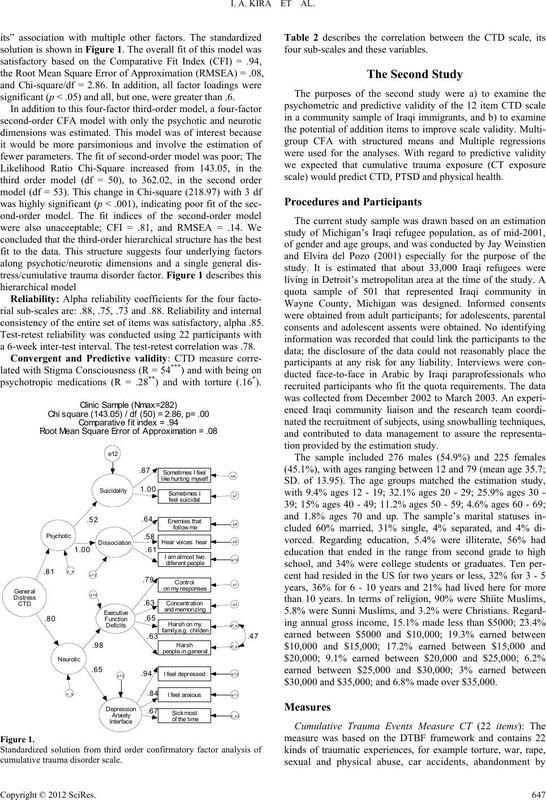 Journal of Psychiatry, 1 4 5 , 674-676.
symptom complexity. Journal of Traumatic Stress, 22, 399-408. Cook A., Blaustein, M., Spinazzola, J., & van der Kolk, B. (2003). American Psychological Annual Convention, Toronto. and future directions. Memory, 15, 295-311. Herman, J. L. (1992). Trauma an d re c o ve r y. New York: Basic Books. analysis. Educational and Psychologica l Me as ur eme nt , 20, 141-151.
torture, and their families. Torture, 14, 38-44. Kira, I., Ashby, J., Lewandowski, L.; Smith, I., & Odenat, L. (2012a). Kira, I., Lewandowski, L., Somers, C., Yoo, J., & Chiodo, L. (2012b). Trauma: International Perspective s on S tr ess & Coping. hilation anxiety. Psychology, 3, 90-99.
ma. Dissertation Abstracts International, 53, 2548.
adult development and aging perspectives. In M. P. Stephens, J.
later life families (pp. 99-121). New York: Hemisphere. Laurie, J. (1996). Cumulative trauma: The non-problem problem. Transactional Analysis Jo ur na l , 26, 276-283.
factorial invariance. Psychometrika, 58, 525-543.
ciety for Traumatic Stress Studies, Washington DC. victims. 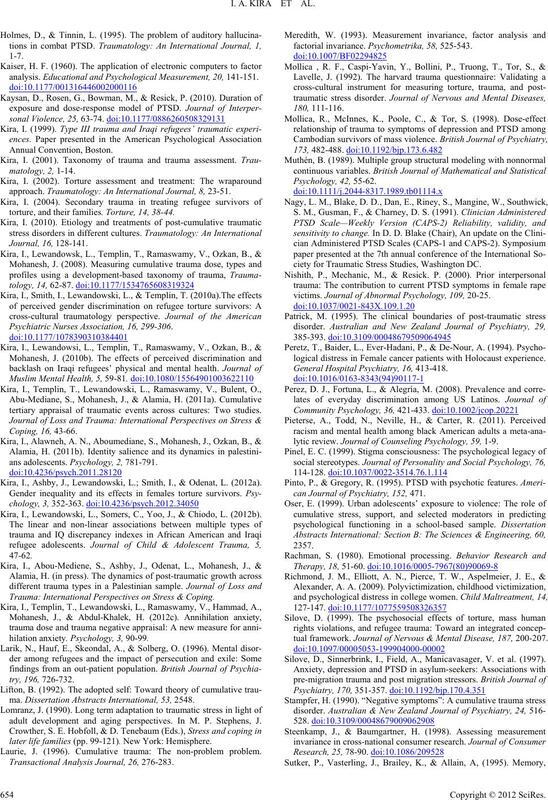 Journal o f Abnormal Psychology, 109, 20-25.
lytic review. Journal of Counseling Psychology, 59, 1-9.
can Journal of Psychiatry, 152, 471.
tual framework. Journal of Nervous & Mental Disease, 187, 200-207. Silove, D., Sinnerbrink, I., Field, A., Manicavasager, V. et al. (1997). cial Psychiatry and Psyc h i atric Epidemiology, 44, 247-254. Terr, L. C. (1991). Childhood traumas: An outline and overview. American Journal of Psychiatry, 148, 10-20.
screening instrument. Trans-Cultural Psychiatry , 45, 566-589.
psychiatric vital signs. Comprehensive Psychiatry, 53, 117-124. 3. I feel sick most of the time.     . 4. I sometimes feel as if I am almost two different people? 6. I try to avoid people and stay by myself.     . 7. I believe I have enemies that follow me anywhere I go.       . 8. I have decreased memory or concentration.      .       . 12. Sometimes I feel like hurting myself.     . 13. I felt like abusing drugs, alcohol, or smoking, or started to. significant decrease in my ability to function. 15. I feel apathetic, with no emotion.  ,    ..